This happened quite a long time ago, about 6 or 7 years ago. The sun had just set and it was quite cloudy and what me and my friend saw was the clouds changing colours in a strange way. One part of the sky would change to a purple colour, slowly fading in and then it would fade out and then a different part of the sky would turn a green colour and faint red colours, by the time we went in, there must have been four or five different colours over the sky, going for a good few miles (can't remember very well, but possibly 5-10km), although we couldn't see behind us as a building was blocking our sight. The diameter of the blotches of colour must have been about 1/2 - 1km but very high up, although I can't be certain. I've always wondered what it could have been. I'm very sure it wasn't some kind of spot light, as there was no beam coming from the ground. Unfortunately I don't have any images or video. Yeah it looks similar, the colours and all, except there were more colours! and they faded in and out so calmly, we thought they were fireworks at first, until the colour stayed the same for a minute or so and when we started spotting new parts of the sky miles from the first, lighting up with another colour. I think this is the same thing, as the sun is setting in that picture and that's how it was at the time, how does it actually happen? Yes this normally happens during sunset. What it comes down to is a dispersion of the colours of the sunlight by high ice clous under certain circumstances. 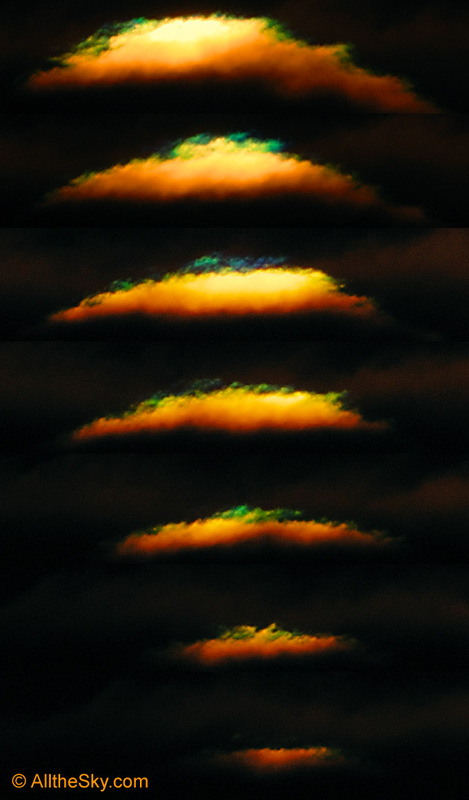 I don't know what 's it called in english but in german it's "green flash" if I'm not mistaken. Google for "green sunset" this should yield a couple of sites where you get closer information. Indeed it is the so called "Green Flash". It can be observed under exceptional circumstances. The atmosphere must be very calm and the horizon behind which the sunrise or sunset occurs should ideally by very sharp. #7 Re: Strange sky anomaly?